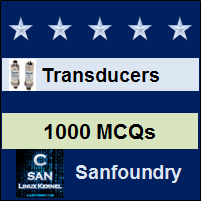 This set of Instrumentation Transducers Multiple Choice Questions & Answers (MCQs) focuses on “Sensor Systems”. 1. Which of the following is correct for tactile sensors? Explanation: Tactile sensors are those which sensitive to touch. Explanation: Sensitivity of a sensor is the change in output for a change in input. 3. Which of the following can be cause for non-zero output when zero input? Explanation: For ideal condition, zero input produces zero output. Explanation: Bode plot can be used for describing the sensitivity of a sensor. 5. Which of the following error is caused by a reversal of measured property? Explanation: Digitization error is caused by a reversal of measured value. Explanation: Resolution is the smallest change a sensor can detect. Explanation: Thermocouple is a device which is capable of producing output voltage according to input temperature. 8. Sensor is a type of transducer. Explanation: Sensor is a device which enables measurement of input value. 9. Which of the following is not an analog sensor? Explanation: All of the mentioned devices are analog sensors. 10. Measured property have no relation with error. Explanation: Error of a system is independent of the measured value.